Then he said, “The Chamber of Commerce of Costa Rica places high importance in the FTA with Korea, as the markets between our two regions are complementary.” Ambassador Solano Quiros discussed a wide range of topics at the interview interesting to Korea and Costa Rica, which included: The most important policies of Costa Rica, major areas of bilateral cooperation in the New Year, competitive products and services of Costa Rica attractive to Korea, areas where Korean companies are wanted for investment, Korean Honorary Consul for Costa Rica, head of head of the bilateral friendship organization, the most prominent Koreans who made the largest contribution to the bilateral cooperation, attractive tourist destinations of Costa Rica to Korean tourists, introduction of the President of Costa Rica, introduction of the Ambassador and family, and introduction of the Ambassador. President Luis Guillermo Solis of the Republic of Costa Rica (right) emphasizes the importance of increased cooperation between the two countries at an interview with Publisher Lee Kyung-sik of The Korea Post media group at the Millennium Seoul Hilton on Oct. 12, 2016. Question: What are in store for increased cooperation between the two countries in the New Year, especially in the area of economic cooperation? Answer: According to the Ministry of Foreign trade, the current trade volume between the Republic of Costa Rica and the Republic of Korea reached approximately $262 million US dollars (2017), with an annual increase of 4.9%. The expectation of the trade volume will increase in 2019 and beyond as the Republic of Costa Rica is currently awaiting the formal ratification of the Free Trade Agreement with the Republic of Korea, since its signage between both parties in February of 2018. Senior North Korean and U.S. officials may meet in Washington, D.C. later this week for consultations on a second summit, a diplomatic source in Seoul said Tuesday. Secretary of State Mike Pompeo is expected to greet Kim Yong-chol, a top aide to North Korean leader Kim Jong-un. 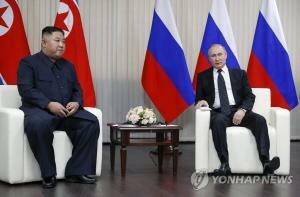 The source pointed out that the two sides are resolved to have face-to-face negotiations. "Given Secretary Pompeo's other commitments, it's true that (he's) available for the talks on Jan. 17-18," the source said. Pompeo has cut short a trip to the Middle East for a family funeral. Samsung South Korea's trade ministry said Wednesday it will speed up efforts to clinch a free-trade agreement (FTA) with Britain amid rising woes over the country's move toward exiting the European Union without an agreement on matters such as customs. The Ministry of Trade, Industry and Energy said it has decided to make greater efforts to reach the trade deal, as London's departure from the European Union is anticipated to have an adverse impact on South Korean companies that deal with the island nation. President Moon Jae-in asked the country's top conglomerates and large firms to increase their local investment and create more jobs Tuesday, amid growing concerns of a possible slowdown that many believe may have been partly caused by his policy of boosting household income. The call came in a special meeting held at the presidential office Cheong Wa Dae, attended by the top executive officers and representatives of about 130 local companies. North Korea will send a top government official to Washington, D.C. later this week, CNN reported Wednesday amid indications that the two sides are moving closer to a second summit. Kim Yong-chol, North Korea's top negotiator and ex-spymaster, plans to arrive there Thursday (local time) for a two-day stay, according to the broadcaster. 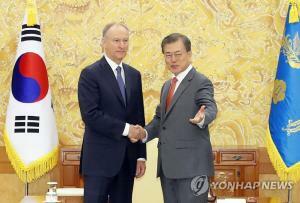 It cited two U.S. sources familiar with ongoing negotiations. South Korea's venture minister said Thursday that the government is committed to expanding support for startups, which eventually would jack up employment. Venture investment in South Korea is estimated at 3.4 trillion won (US$3.04 billion) last year, which marks a hike of over 40 percent from a year earlier, according to Minister of SMEs and Startups Hong Jong-haak. "For this year, state-involved venture investment funds will be boosted, and the government will encourage private investors to spend more for startups," Hong said in an interview with Yonhap News Agency. U.S. Vice President Mike Pence has called on North Korea to take "concrete steps" to dismantle its nuclear weapons program as the two nations are set to hold high-level talks to arrange a second summit in Washington. Pence on Wednesday told a meeting of chiefs of U.S. overseas diplomatic missions that while President Trump has started a promising dialogue with North Korean leader Kim Jong-un, the U.S. still awaits concrete steps by North Korea to dismantle the nuclear weapons that threaten its people and its allies in the region. Bloomberg says a top aide to North Korean leader Kim Jong-un will meet with U.S. President Donald Trump when he travels to Washington this week. North Korea's top negotiator, Kim Yong-chol, is reportedly flying to Washington DC to meet with U.S. Secretary of State Mike Pompeo to arrange a second summit between their leaders. Quoting two sources familiar with the matter, Bloomberg reported on Thursday that a meeting with President Trump is included in Kim’s Washington trip. South Korea and China will hold director general-level discussions this week on the delimitation of maritime boundaries. The two-day meeting will open Thursday in Xiamen in China's southeastern Fujian Province. 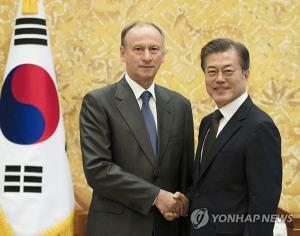 It will be led by Director-General for International Legal Affairs of the South Korean Foreign Ministry Bae Jong-in and Ambassador for Yellow Sea Affairs of the Chinese Foreign Ministry Wang Xiaodu. South Korean and U.S. government officials had a "working group" session on North Korea via videoconferencing Thursday, Seoul's foreign ministry said, as Pyongyang and Washington look set to resume high-level negotiations. 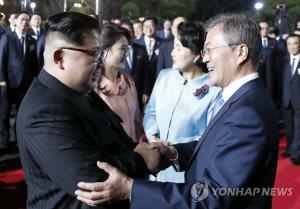 As part of regular consultations on the matter, the two sides talked about "various pending issues," including North Korea-U.S. relations and inter-Korean cooperation, it added. The ministry did not provide other details. President Moon Jae-in officialized a move to build a so-called hydrogen economy Thursday, one day after the government announced an ambitious plan to increase the number of hydrogen-powered vehicles in the country to 80,000 in less than four years. 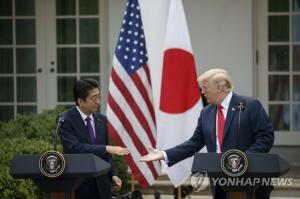 "Our government's determination to (build) a hydrogen economy is firm," the president said during a visit with leaders from hydrogen-related businesses, including Hyundai Motor Co.
Hyundai Motor Co. and its smaller affiliate Kia Motors Corp. said Thursday they will recall approximately 168,000 vehicles in the United States over defective fuel pipes. The recall involves fixing improper repairs during the previous two recalls over engine failures and offering software upgrades for the affected vehicles, the companies said. The software update is designed to protect the vehicles from engine damage, and new extended warranties will be offered for engine problems, they said. The British parliament’s latest rejection of the government’s proposed Brexit deal is likely to have a limited impact on global financial markets as well as the South Korean economy, Seoul’s government said Wednesday. Vowing pre-emptive steps to counter a possible fallout, Korean authorities will work on preparations for a bilateral free trade deal with Britain, as the latter will no longer be subject to the Korea-EU Free Trade Agreement upon Brexit. South Korea will increase the number of hydrogen-powered vehicles on the roads by 80,000 units in the next four years, the finance minister said Wednesday. Deputy Prime Minister and Minister for Economy and Finance Hong Nam-ki said at a ministerial meeting on innovation-led growth in Seoul that the new fuel-cell electric vehicle target is part of a broad strategy aimed at building an ecosystem for hydrogen industries. It would include producers of the fuel as well as technologies that store and transport the energy. The final plan on the government’s hydrogen drive is set to be announced Thursday at a meeting with the attendance of President Moon Jae-in, officials said. Two foreign sailors went missing and another was injured after a fishing boat caught fire in waters off the southwestern coast Thursday, authorities said. The 85-ton vessel carrying 12 crewmen caught fire in the sea off about 6.4 kilometers northeast of Narodo, an island in Goheung county, South Jeolla Province, at around 8:25 a.m., the Coast Guard said. British Prime Minister Theresa May survived a no-confidence vote in Parliament on Wednesday to remain in office ― but saw more of her power ebb away as she battled to keep Brexit on track after lawmakers demolished her European Union divorce deal. May won a narrow victory, 325 votes to 306 votes, on an opposition motion seeking to topple her government and trigger a general election. U.S. economic forecaster Allen Sinai made optimistic observations during a recent visit to Korea. In a breakfast lecture hosted by the Institute for Global Economics (IGE) at the Korea Press Center, Tuesday, Sinai forecast that in 2019 the U.S. Federal Reserve may not raise interest rates, contradicting other forecasters on the chance of recession. The economist, well recognized for his precision, said U.S. growth may reach 3 percent, coupled with the continuation of global expansion. North Korean Vice Foreign Minister Choe Son-hui is expected to meet the U.S. Special Representative for North Korea Stephen Biegun in Stockholm soon, sources said Tuesday. Choe arrived in Beijing that day before boarding a flight to Stockholm. A government source here said, "It seems that Choe and Biegun will meet in Sweden" to discuss a second summit between North Korean leader Kim Jong-un and U.S. President Donald Trump. A group of overseas Korean businesspeople who visited North Korea last November bought paintings at Pyongyang's Mansudae Art Studio, which churns out propaganda work, but were caught in customs. The Korea Customs Service on Thursday revealed that 96 members of the World Federation of Korean Association of Commerce went to an event in Pyongyang on Nov. 18. Hyundai's small Kona SUV will soon become more visible in Singapore as the carmaker has formed a partnership with ride-hailing app Grab, the "Uber of Southeast Asia. "Hyundai said on Wednesday that the Kona is the first electric vehicle added to Grab's service lineup. Grab has bought 20 Konas for its first batch and plans to increase the number to 200 by the end of this year. This past weekend, US President Donald Trump reportedly sent a personal letter to North Korean leader Kim Jong-un. Kim Yong-chol, vice-chairman of the Central Committee of the Workers' Party of Korea (WPK) and head of the WPK’s United Front Department, is expected to visit Washington, D.C., as early as Jan. 17 or 18 to hold high-level talks with US Secretary of State Mike Pompeo. The first defense white paper released during the administration of South Korean President Moon Jae-in deleted a phrase about the North Korean regime and military being the “enemy” of South Korea. The white paper placed new emphasis on South and North Korea pursuing military confidence-building, meaningful arms control and incremental arms reduction. The 2018 Defense White Paper was published on Jan. 15 by South Korea’s Ministry of National Defense (MND). During his “town hall” meeting with the leaders of the South Korean business community on Jan. 15., President Moon Jae-in, in gesture to lighten the atmosphere, proposed that people take off their jackets and talk frankly, taking his off first. Korea Chamber of Commerce and Industry Chairman Park Yong-maan was among the first to follow, upon which several others in attendance, including Samsung Electronics Vice Chairman Lee Jae-yong, did the same. he British House of Commons rejected Prime Minister Theresa May’s plan to withdraw the country from the EU. Members of Parliament (MPs) voted by 432 votes to 202 to reject the deal. It was a landslide defeat in which opposition votes doubled votes in favor. Even 118 Tory MPs voted against the British government. The large opposition, which is stronger than predicted, comes as great confusion to Britain and the rest of the world. China may actually be a more competitive partner for North Korea’s economic development than South Korea, according to Korea Chamber of Commerce & Industry (KCCI) Chairman Park Yong-maan on Wednesday. The remark came during KCCI’s third conference on the North Korean economy on Tuesday in central Seoul. The North’s improved relations with South Korea and the United States have sparked anticipation on the future possibility of investment and trade with local companies. Lee Kee-heung, chairman of the Korean Sports & Olympic Committee bowed three times as he apologized to the nation for the sexual violence cases in the sports circle, which have stirred social controversy. The way to this year's first board meeting was lined with members of civic sports organizations demanding Lee’s resignation and journalists covering the story. On January 15, Lee Kee-heung apologized to the public for the physical and sexual violence in sports and announced measures to eliminate physical and sexual violence and abuse ahead of the first board meeting of the Korean Sports & Olympic Committee in 2019 held at the Olympic Parktel in Bangi-dong, Songpa-gu, Seoul. With mobile technologies maturing rapidly, foldable displays are the beginning of a "sea change" in the smartphone form factor, a senior researcher at Samsung's mobile communications division said, predicting technological innovation will make smartphones more central to everyday life than ever before. Foldable screens demanded a total reconfiguration of smartphones from inside out, with the battery, cooling system and camera being placed inside a slim body efficiently, Kim Hark-sang, who heads the visual R&D team at Samsung's mobile communications business, said in an article posted Samsung's website. A state-funded research institute will join hands with researchers from private companies and colleges to develop innovative solar-thermal desalination technologies. It aims to build a test plant capable of producing 10 tons of fresh water per day in South Korea by 2020. The goal, outlined by the Korea Institute of Machinery and Materials (KIMM) on Thursday, is to build desalination facilities with a capacity of 1,000 tons in Saudi Arabia and other Middle East countries by using a cost-competitive innovative high concentration photovoltaic thermal (HCPVT) system. A South Korean venture capital fund created by Mirae Asset, a major financial and asset management group, and South Korea's top internet portal Naver will invest $50 million in Bukalapak, a leading online marketplace in Indonesia. Mirae Asset gave no details. The one trillion won start-up fund, called Asia Growth Fund, was created last year for investment in promising start-ups and technology-related firms in Southeast Asia, India and China. As its first investment, the fund funneled some $150 million into Grab, a Singapore-based firm, which offers ride-hailing and logistics services through its app in Southeast Asia. As cryptocurrencies such as Bitcoin are continuing their downward tumble, all employees at South Korea’s largest cryptocurrency exchange Bithumb now face redundancy, a stark contrast to the company’s move to add more than 300 new employees early last year. A joint growth fund led by South Korea’s top securities firm Mirae Asset Daewoo Co. and Internet giant Naver Corp. will invest $50 million in Indonesian e-commerce startup PT Bukalapak.com, Mirae Asset said on Wednesday. Bukalapak – a Jakarta-based unicorn company valued at over $1 billion – operates an open market platform that connects merchandisers and buyers (consumers) online for a diverse range of products from financial items to mobile plans. More than 2 million transactions are made per day. The company has witnessed rapid growth in recent years with total transaction volume in the October-December period of last year already surpassing the amount for full 2017. 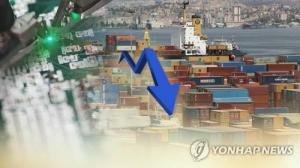 The National Pension Service (NPS) will decide by early next month its actions as a major shareholder in Hanjin KAL and its key flagship Korean Air Lines in regular shareholders’ meetings in March where agendas would include reconfirmation of board members under the influence of the owner family embroiled in a series of prosecution probe.